New furs means new monsters!! For those of you not following me on Instagram, Facebook or Twitter, this is your lucky day! Today I'm going to be showing the new furs I bought from Amazon and the fun monsters I made from them. When I got back from Toronto for doing the One Of A Kind show, I thought it'd be nice to buy some new furs. Furs I've been eyeing that others use, but I've never seen sold in Canada. So I hopped on Amazon and bought 5 colours. To my horror, the UPS brokerage fees were almost half the cost of the shipment. I paid it, but that was the last time I'd buy furs from Amazon. So far I haven't made anything out of the pure hot pink fur, but be sure to know that I will be very soon! In the meantime, check out the newest monsters available for purchase! The following monsters are available on the ONE OF A KIND ONLINE shop! To recap, these monsters are all available in my One Of A Kind Online shop. :) You should check it out! It's full of artisans who have participated at the One Of A Kind show in Toronto, and now you can buy their products year round! The following two monsters are a new face style I came up with years ago. I got inspired by a few artists I saw, and drew my own face / monster body to go with it. I didn't want to draw up a completely new body pattern, so I used one that I knew worked already. The one I used is for the large Yetis or the Skullian monsters (black fur, skull face). In fact, I was going to make a few Skullians when I suddenly remembered those sketches from a few years past. 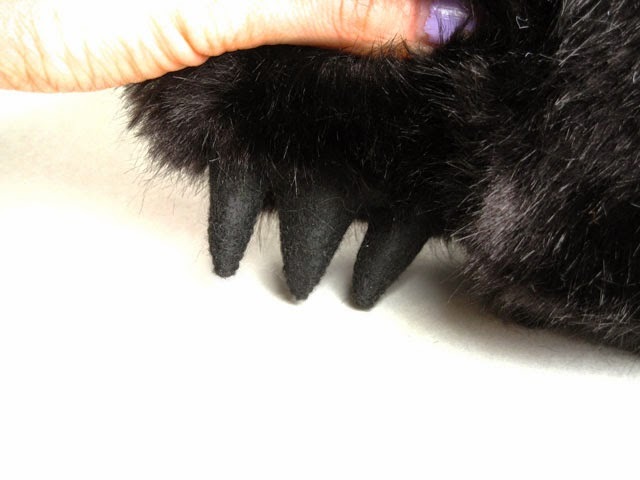 Instead of the standard paws for hands, I made claws. What makes these monsters special is not only their original faces and cute claws, but the embroidery detail I put in their forehead. I did some french knots! These guys are definitely one of a kind monsters, and there's only one of each for sale. The following monsters are available in my main shop! These are his cute claws! Lastly I have my Ludo series. I was inpsired from the movie the Labyrinth, and thought I'd make a few monsters from some of the new furs that weren't hot pink or rainbow. They have embroidered faces and plastic safety eyes which makes them very different from my other monsters which have no plastic pieces. These guys are definitely NOT for small kids due to the choking hazard. This is Chaz. He's a lemon yellow Ludo-inspired monster. This gorgeous one is named CherryBomb! Thanks for reading my blog! If you want to stay up to date on news and new monsters, you can follow me on Facebook, or Instagram!